Universal Pictures and Sony Pictures have released the first domestic and international trailers for the fourth film in the Insidious franchise, "INSIDIOUS: THE LAST KEY". In the supernatural thriller, which welcomes back franchise standout Lin Shaye ("THE BLACK ROOM", "ABATOIR", "OUIJA: ORIGIN OF EVIL") as Dr. Elise Rainier, the brilliant parapsychologist faces her most fearsome and personal haunting yet: in her own family home. Shaye is joined in the cast by Angus Sampson, Leigh Whannell ("SAW" trilogy, "COOTIES"...), Josh Stewart, Caitlin Gerard ("SMILEY"), Kirk Acevedo ("DAWN OF THE PLANET OF THE APES"), Javier Botet ("IT", "POLAROID"), Bruce Davison ("THE EXORCIST"), Spencer Locke ("RESIDENT EVIL: RETRIBUTION", Tessa Ferrer, Ava Kolker ("THE AXE MURDERS OF VILLISCA") and Marcus Henderson ("GET OUT"). The film is written by co-creator Leigh Whannell ("SAW"), who wrote the trilogy and directed Chapter 3; produced by "INSIDIOUS" regulars Jason Blum ("THE PURGE" series, "GET OUT"), Oren Peli ("PARANORMAL ACTIVITY") and co-creator James Wan ("THE CONJURING", "FURIOUS 7"); and directed by series newcomer Adam Robitel ("THE TAKING OF DEBORAH LOGAN"). 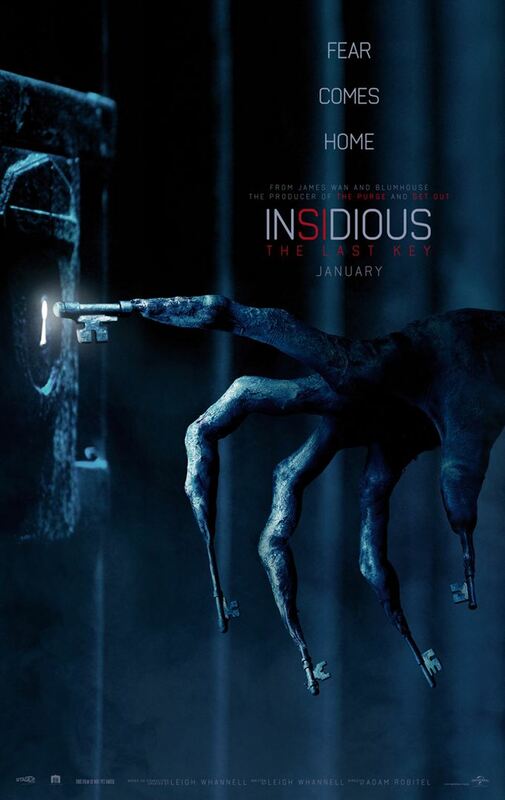 "INSIDIOUS: THE LAST KEY" arrive in theaters January 5, 2018. Synopsis : The parapsychologist Dr. Elise Rainier has nightmares with her childhood in New Mexico, where she lived with her brother Christian, her supportive mother Audrey and her father Gerald, who frequently beats her when she claims that she sees ghosts everywhere in the house. When the client Ted Garza calls Elise to ask for help since he is haunted since he moved to a house in New Mexico, Elise refuses the request since the address is the same house where she spent her childhood. However she changes her mind and accepts the job, and travels with her assistants Specs and Tucker to New Mexico where they will discover an evil entity in the house.